Durability is an important feature of the quality of the goods that is valued by consumers and affects the prices they are willing to pay for it. Durability is usually referred to as the speed at which quality deteriorates. Crime and the durability of goods are strongly connected issues. In fact, a large share of property crimes worldwide involves durable goods, which are goods that are not consumed or destroyed and can be used for a period of time. In the crime economics basic framework (Becker 1968; Erlich 1973), durability can be considered one of the characteristics of the goods that potential criminals take into account when making their decision to get involved in illegal activities. However, surprisingly, the durability of goods and crime have been studied separately and there has not been any link between the literature on the production of durable goods and the literature on crime. Our new paper “Crime and Durable Goods” (Galiani, Jaitman and Weinschelbaum, 2016) is the first to connect these two strands of the literature in a theoretical model. So far, on the one hand, there has been remarkable progress in the analysis of crime from the criminology and crime economics perspectives since Gary Becker’s seminal paper in 1968. Studies focusing on factors that increase the expected costs or reduce the expected benefits of committing crimes led to important, mainly empirical, contributions to the crime-reducing impact of different law enforcement, education, and employment policies (see, for example, Machin et al., 2013 and Machin and Draca, 2015). On the other hand, microeconomic theory has studied the optimal durability of goods to disentangle whether, under the monopoly market structure, social optimum durability is achieved. This literature, which has evolved since the 1960s, has found that under reasonable assumptions a monopolist under-produces durability. The underlying reason is that the durability of the goods links the production of present and future periods and if durability is lower it allows for higher prices of new goods in the future periods. In summary, the literature on crime has been focused on the demand side of stolen goods (the criminals) and has not addressed the producer side of the potentially stolen goods as an important determinant of the features of goods that affect their prices. Durability is one of such features. The literature on the production of durability has not addressed the possibility of crime occurring. In our paper we develop a theoretical model to study the connection between durability and crime. In order to formally assess the link between crime and the optimal level of durability, we develop a model that adds crime to the standard framework of the production of durable goods by Waldman (1996). Crime produces market and non-market externalities because the losses and damages it causes go beyond the stolen objects and can lead to long-lasting negative consequences, even death. The model shows that crime reduces the optimal level of durability. Unlike a scenario without crime, perfect competition does not provide the optimal durability level, even if we do not consider the non-market externalities caused by crime like traumas and even death. To introduce the possibility of crime occurring in the standard Waldman (1996) model, two technologies for stealing are studied: the random stealing technology in which durability is not observable (all types of goods have the same probability of being stolen); and the selective stealing technology in which durability is observable and criminals target the goods with the highest durability. Perfect competition sets a durability level that is higher than the social optimum, i.e., it over-produces durability under the random stealing technology and produces zero durability under selective stealing. The monopoly market structure sets a durability level that is lower than the social optimum, i.e., it under-produces durability, regardless of the stealing technology. If we also consider the non-market externalities caused by crime, the optimal social level of durability gets closer to the one that prevails under monopoly. We find that if this externality is big enough, even the monopoly market structure could over-produce durability. Our model has clear policy implications: the durability of goods, and the market structure under which goods are produced, can affect the equilibrium crime rate. Interventions that attempt to reduce the level of durability of goods make stealing less profitable, which leads to a reduction in the incidence of acquisitive crimes. Additionally, making the durability of goods contingent on those goods being stolen would also likely increase welfare by diminishing the future utility or resale value of those goods if they are stolen. Moreover, traditional policy recommendations to reduce crime, such as an increase in the severity or celerity of sanctions, probably have a lower impact in the long run through the equilibrium effect that the reduction of crime have on the durability of the goods. Existing evidence and the recent technological advancements tend to confirm that the durability increases the attractiveness of the goods as targets of crime consistent with the crime economics model. Under this crime economics framework, criminals can be deterred from committing crimes by policies that either reduce the expected net benefits from crime vis-à-vis legal activities or increase the expected payoff from working legally. For example, increasing the certainty, celerity, and severity of punishment can reduce the net return to crime (by increasing the expected cost of criminal activity), while increases in salaries in the legal sector can reduce the number of criminals. The parallel of that concept for the purpose here is that a reduction in the durability of stolen goods can also reduce crime, since it reduces the pecuniary benefits of crime. This is because it is intuitive to think that the less durable a good, the lower its resale price will be and the lower its consumption value for the thief. Consequently, as the benefits of illegal activities decrease, ceteris paribus, criminals will find it less profitable to devote themselves to illegal activities. In an extreme case, if durability is zero and thus goods do not yield services once stolen, criminals would not benefit from stealing goods, and this type of acquisitive crime would not occur. Interestingly enough, there is empirical evidence of a decrease in car thefts once technologies to deter these crimes were introduced. According to a study by Morgan et al. (2016), vehicle thefts started rising in the 1960s, and steering locks were introduced as a result. The locks did not stop vehicle thefts, leading to a “second wave” of security devices in the 1980s and 1990s that included central locking, car alarms, and – most importantly – electronic immobilizers (devices fitted to vehicles that prevent starting the engine without the key, which contains a microchip uniquely programmed by the dealer to match the car). Vehicle thefts began to fall sharply as many of the second-wave devices spread through the vehicle fleet. 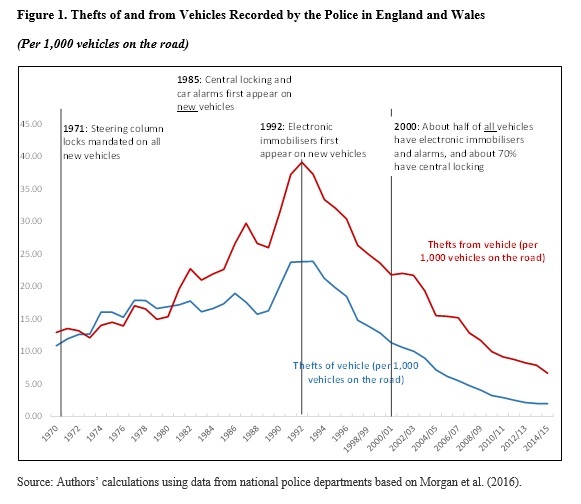 Once electronic immobilizers were installed on around half the vehicle fleet in certain nations, those nations saw a sharp decline in vehicle thefts of around 40 percent (see Figure 1). The spread of electronic immobilizers happened more quickly in Europe and Australia than in the United States and Canada due partly to the presence and timing of legislation mandating the installation of such immobilizers in new vehicles by producer. This was a clear shock to the market of durable goods from the supply side. Legislation was important in putting the burden on producers rather than consumers – according to Morgan et al. (2016) there was little evidence of consumers retrofitting electronic immobilizers to existing vehicles, and installation of immobilizers by suppliers required no knowledge or conscious action by the consumer (most people do not know their car has an electronic immobilizer and do not need to even switch it on). The channel through which this intervention reduced crime was by making theft more difficult, not because it led to more offenders being caught (vehicle crime detection rates changed little during the period of sharp decline in offenses). Van Ours and Vollaard (2016) also find supporting evidence of the crime-reducing effect of the electronic engine immobilizer in Europe. The telecommunication industry is also developing new technologies to help make cellular phones less attractive to thieves. This is mainly achieved by making them harder to use the phones reducing their durability upon the device being stolen and thus reducing their value in the stolen goods market. Becker, G. 1968. Crime and Punishment: An Economic Approach. Journal of Political Economy 76(2): 169–217. Draca, M., T. Koutmeridis, and S. Machin. 2015. The Changing Returns to Crime: Do Criminals Respond to Prices? CAGE Working Paper, Warwick University. Ehrlich, I. 1973. Participation in Illegitimate Activities: A Theoretical and Empirical Investigation. The Journal of Political Economy 81(3): 521–65. Galiani, S., L. Jaitman and F. Weinschelbaum, 2016. Crime and Durable Goods, NBER Working Paper Number 22788. Available at: http://www.nber.org/papers/w22788. Machin, S., and M. Draca. 2015. Crime and Economic Incentives’, Annual Review of Economics, 7: 389-408. Morgan, N., O. Shaw, A. Feist, and C. Byron. 2016. Reducing Criminal Opportunity: Vehicle Security and Vehicle Crime. UK Home Office Research Report 87. Available at: https://www.gov.uk/government/uploads/system/uploads/attachment_data/file/489097/horr87.pdf. Van Ours, J.C., and B. Vollaard. 2016. The Engine Immobiliser: A Non‐Starter for Car Thieves. The Economic Journal 126(593): 1264–291. Waldman, M. 1996a. Durable Goods Pricing When Quality Matters. Journal of Business 69(4): 489–510.